Every year, Eaton Corp. (known for superchargers, valve-train components, etc.) invites engineers from Ford, GM, and DaimlerChrysler to Milan dragway for a day at the track. This was the second time I'd ever visited the track with the Stealth and managed only a pair of 12.7's. (Pre datalogger / tuning). The others shown are co-workers and friends (not necessarily both). Note: the Vette and Z28 were essentially stock and their 60ft times suffered due to poor track conditions. It began to rain before more runs could be made. The 5th annual dream cruise lived up to the usual hype "World's largest Cruise" with almost every make and model imaginable making an appearance. This shot was taken in front of the Fred Lavery Audi/LandRover/Porsche dealership. Closest is a Saleen Mustang, Viper Coupe behind the Stang, my Stealth in front of the Stang, Tim Liu's beautiful VR4 across from me, and a V8 turbo Lotus somewhat hidden by Tim's VR4. I didn't get much street action due to the heavy traffic on Woodward until the following day when our Michigan 3SI club had a mini-gathering (9 Stealths). Five of us went out on Woodward and in two laps I managed to defeat a Z28 convertible, a C5 (had to egg him on for awhile), a 2nd generation Camaro (drag slicks with 6pt cage - I think he was out of NOS), and an older Mopar. I normally wouldn't pick on so many cars, but I felt compelled with so many fellow 3SI members around. If you ever find yourself in the Detroit area in late August, you must visit Woodward. It is pure performance heaven the entire week leading up to the cruise. I'm sure we (Michigan 3SI) will have a gathering during the cruise each year. LEFT - My brother Mark and I putting on our "game face" before the race (notice I've got all the protective clothing). RIGHT - John Schneider, a.k.a. Bo Duke from the "Dukes of Hazzard", taking a few minutes to chat and pose for a picture with me before the race. John and his Hemi powered '69 Charger received lots of attention (great personality). At the track and on the street, I managed many victories but did suffer a few reality checks at the hands of two Vettes and another Dodge Stealth. The Vettes comprised of Karl's ATI supercharged and intercooled LT1 (favor was returned) and a high compression black '96 LT4 (visitor from Texas). 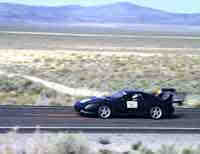 The Dodge Stealth that out ran me belongs to fellow Michigan 3SI member Murray (a.k.a. Nitehawk on the 3SI board). But that was last year, I plan on having a few more ponies at bay soon. While my car remained under the knife during the summer of 2000 (no engine under the hood), the "competition" improved. Kevin's Vette became a serious contender with a healthy dose of power from a purpose built ARE (Agostino Racing Engines) 383. There is also more to come with headers and a new cat back exhaust. A little dyno tuning, possibly some slicks, and maybe even NOS (changes his mind day to day), and this car could become a certifiable rocket. Looks were also improved with the addition of white Gran Sport rims. Mike became the happy owner of a "black is beautiful" '86 Grand National during 2000. And with nothing more than some good gas (to keep the engine happy at 18 psi boost) and slicks, ran well into the 12's with an essentially stock set-up (stock fuel system, turbo, intercooler, and internals). We all know it doesn't take much for the old turbo Buick 3.8L to hang with the big boys, the question is, will Mike take it to the next level?